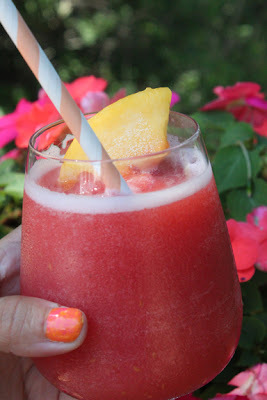 The warm weather has me craving something frozen to drink by midday and my current go-to is a copycat version of the Cheesecake Factory’s Georgia Peach drink. To make: Combine 2 ounces vodka, 1 ounce peach liqueur, ½ cup peach slices (fresh or frozen) and ½ cup crushed ice in a blender. Add ¼ cup raspberry juice (I squeezed raspberries in cheesecloth) and blend briefly. 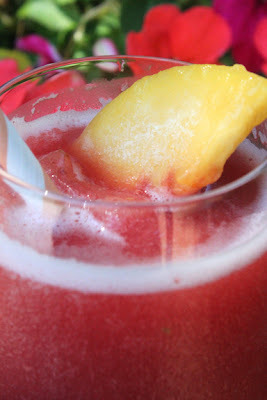 Pour into two glasses garnish with a mint leaf, raspberry or peach slice and enjoy. Of course since I don’t drink I followed the same recipe but left out the alcohol and added water as well as extra raspberry juice. This drinks sound perfect for summer.